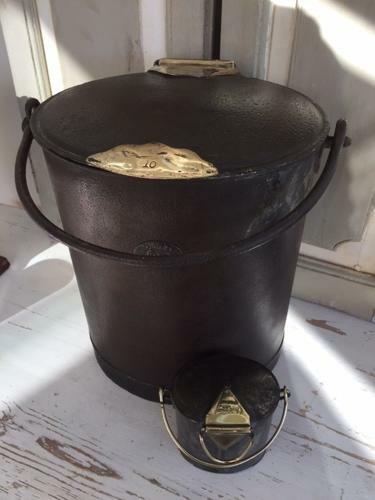 Large Antique Dairy Delivery Cream Can with brass fittings. Used to deliver cream in the streets by pedlars etc using the milk cart. Inside is a wire fixing to hang the cream ladles once empty. The front bears the Lister Dairy Label. The can is sound with no holes and good fitting lid. This size is ideal for storing cat food, porridge oats etc for want of a better use. They look particularly good with the early cream ladles hanging off the side in particular the ones with the brass handles.